Tens Of Thousands Gather In Bangkok Ahead Of Royal Cremation Ceremony : The Two-Way The revered King Bhumibol Adulyadej died in October 2016, with his remains lying in state at the royal palace in Bangkok. The ceremony will conclude a year of mourning for the Thai people. Thai mourners holding portraits of the late King Bhumibol Adulyadej line up to take part in the Royal Cremation ceremony in Bangkok, on Wednesday. More than a year after the death of Thailand's King Bhumibol Adulyadej, the country began a five-day run-up to the late monarch's cremation ceremony. 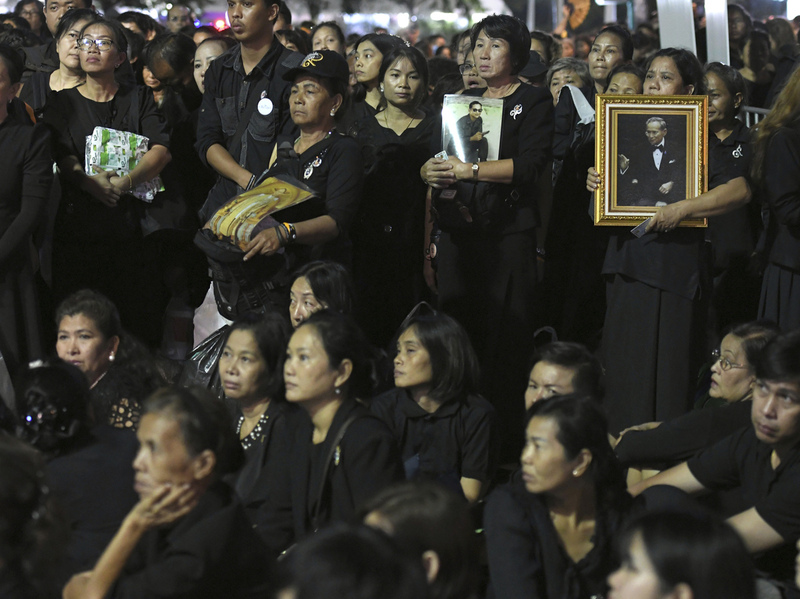 Following Buddhist tradition, people dressed in black as they gathered to pay respects to Bhumibol, also known as Rama IX, the ninth king in the country's Chakri dynasty. His death on Oct. 13, 2016, at age 88 prompted an outpouring of emotion from ordinary Thais, who revered him. More than 12 million people have paid their respects at the throne hall of the royal Dusit palace in the capital, Bangkok, where the late king's remains have been housed for the past year. The ceremony concludes a year-long mourning period. "Mourners have been gathering at the cremation site for several days now, some camped out in the heat and pouring rain in order to claim their spot for the royal cremation scheduled for late Thursday evening." "At the time of his death last year at age 88, the much loved [Bhumibol who] was the world's longest serving monarch — he ruled for 70 years — the only king most Thais had ever known." As saffron-robed monks chanted, Bhumibol's son and successor, King Maha Vajiralongkorn, "knelt beneath a nine-tiered golden umbrella. The ceremony was preparation for the moving of an urn representing Bhumibol's remains to the crematorium built over the past year," according to The Associated Press. The Bangkok Post notes also that "foreign dignitaries continued to arrive for the main ceremony on Thursday." The newspaper says that the royal crematorium "is designed specifically for the funeral rites for a king, based on ancient royal traditions. Standing at 53 metres [174 feet] high, the edifice sits on a three-tiered, square shaped base with a staircase on each of the four sides, each side measuring 60 metres [197 feet] wide." A quarter of a million people were expected to line Bangkok's streets for the royal funeral procession.